This is a guest post by Duncan Watts, a principal research scientist at Yahoo! 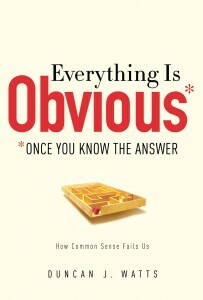 Labs, and the author of Everything is Obvious: Once You Know The Answer. As these two quotes illustrate, there is something strangely conflicted about contemporary views on government and policy. On one hand, many people are in apparent agreement that government frequently accomplishes less than it ought to, sometimes embarrassingly so. Yet on the other hand, many of these same people are also of the opinion that the failings of government do not imply any great difficulty of the problems themselves—that they are not rocket science, as it were. Typically the conflict is resolved with reference to the presumed incompetence, pigheadedness, or outright corruption of our leaders. If only we elected the right people, gave them the right incentives, and—above all—if only our political leaders exhibited a little more common sense, everything would be alright. That both “we” and “they” consistently fail to follow these simple steps proves only that common sense is not nearly common enough. There may be some truth to this attitude. But as a sociologist, I’ve also learned to be skeptical of common sense, especially when it is invoked as the solution to complex social problems. Sociology, of course, has its own conflicted history with common sense. For almost as long as it has existed, that is, sociology has had to confront the criticism that it has “discovered” little that an intelligent person couldn’t have figured out on his or her own. Why is it, for example, that most social groups, from friendship circles to workplaces, are so homogenous in terms of race, education level, and even gender? Why do some things become popular and not others? How much does the media influence society? Is more choice better or worse? Do taxes stimulate the economy? Social scientists have struggled with all these questions for generations, and continue to do so. Yet many people feel they could answer these questions themselves—simply by examining their own experience. Unlike for problems in physics and biology, therefore, where we need experts to tell us what is true, when the topic is human or social behavior, we’re all “experts,” so we trust our own opinions at least as much as we trust those of social scientists. Nor is this tendency necessarily a bad reaction—any theory should be consistent with empirical reality, and in the case of social science, that reality includes everyday experience. But not everything about the social world is transparent from common sense alone—in part because not everything that seems like common sense turns out to be true, and in part because common sense is extremely good at making the world seem more orderly than it really is. As sociologists are fond of pointing out, common sense isn’t anything like a scientific theory of the world. Rather it is a hodge-podge of accumulated advice, experiences, aphorisms, norms, received wisdom, inherited beliefs, and introspection that is neither coherent nor even internally self-consistent. Birds of a feather flock together, but opposites also attract. Two minds are better than one, except when too many cooks spoil the broth. Does absence make the heart grow fonder, or is out of sight out of mind? At what point does try, try again turn into flogging a dead horse? And if experience is the best teacher, when should one also maintain a beginner’s mind? Nevertheless, once we do know the answer, it is almost always possible to pick and choose from our wide selection of common-sense statements about the world to produce something that sounds likely to be true. And because we only ever have to account for one outcome at a time (because we can ignore the “counterfactuals,” things that could’ve happened, but didn’t), it is always possible to construct an account of what did happen that not only makes sense, but also sounds like a causal story. To take a common example, think about how we explain success. Why is the Mona Lisa the most famous painting in the world? Why did J.K. Rowling‘s Harry Potter books sell over 300 million copies? And why is Madonna the most successful female musical artist of all time? Now that we know who these superstars are, their success seems easy to explain—common sense even. They simply outperformed the competition. Whether they did that through pure genius, clever marketing, or sheer tenacity is a matter of debate (you be the judge), but in the end, it doesn’t really matter. In the competitive marketplace of ideas, a product succeeds because it represents what people want—otherwise, they wouldn’t have devoted their scarce time, money, and attention to it. Right? Well, sort of. But if that’s true, why are superstars so hard to pick out in advance? Why did several children’s publishers reject the initial Harry Potter manuscript? Why did no one pay much attention to the Mona Lisa for nearly 400 years? And why did music critics dismiss the early Madonna as an attention seeker with limited talent? Whatever their personal preferences, how could they have failed to understand the demands of the marketplace, which after all is precisely what they are rewarded for doing? Nor is it just the critics who get their predictions wrong—marketers can’t seem to figure out what will sell either. If they could, they wouldn’t waste their efforts on the vast majority of books, movies, and albums that lose money. So what explains why some cultural products are stunningly successful, while most aren’t; and why at the same time, no one, including the experts, seems to be able to predict which is which? A few years ago, my students and I studied exactly this question by setting up an experiment in which roughly 15,000 participants were asked to listen to, rate, and download songs by unknown bands off a website we created. Some of the participants had to make their decisions independently, while others had information about which of the songs other people liked. We found two results. First, in the “social influence” condition, popular songs were more popular (and unpopular songs less popular) than in the independent case. But second, it became harder to predict which particular songs would be the most popular. What these results suggest is that in the real world, where social influence is much stronger than in our artificial experiment, enormous differences in success may indeed be due to small, random fluctuations early on in an artist’s career, which then get amplified by a process of cumulative advantage—a “rich-get-richer” phenomenon that is thought to arise in many social systems. A critical feature of this experiment was our ability to create multiple “worlds” in which randomly assigned groups of people could create different versions of history in parallel with each other. By observing how popular the same song became in different worlds, we could measure directly how much of its success can be attributed to some intrinsic “quality,” and how much results from random chance. We found that although, on average, good songs do better than bad songs, the random fluctuations arising from social influence were larger than those arising from differences in quality. The problem with this explanation, however, is that in real life we never get to experience these multiple histories—only the one history that we have lived through. So although one can argue that Madonna or Harry Potter or even Shakespeare may owe their success more to random chance and cumulative advantage than to intrinsic superiority, it is impossible to refute the common sense view that history took the path that it did because the winners embodied precisely the greatness to which we attribute them. And for a Madonna or a Harry Potter or a Shakespeare fan, that is typically the end of the argument. Common sense, in other words, is extremely good at making the world seem sensible, quickly classifying believable information as old news, rejecting explanations that don’t coincide with experience, and ignoring counterfactuals. Viewed this way, common sense starts to seem less like a way to understand the world, than a way to survive without having to understand it. Fortunately, in recent years the explosive growth of the Internet has brought with it the ability to measure the actions and interactions of millions of people simultaneously. Not just social networking services like Facebook, Twitter and YouTube, but email interactions, instant messaging, and Internet phone calls all provide measurable traces of the person-to-person interactions that have always been at the core of social life, but have until recently been invisible to science. Already this flood of data has generated enormous interest in the research community, with thousands of physicists and computer scientists beginning to pay attention to problems traditionally in the domain of the social sciences. It’s tempting to look back at past technological breakthroughs, such as the telescope or the microscope, when new instrumentation made the previously invisible visible, and wonder if perhaps social science is on the edge of its own scientific revolution. But if we are to make use of these impressive new capabilities to address the kinds of problems that governments have historically failed to solve, we also need to think differently about the problems themselves. Social problems, that is, must be viewed not as the subject of rhetorical debates, but as scientific problems, in the sense that some combination of theory, data, and experiment can provide useful insights beyond that which can be derived through intuition and experience alone. Clearly we’re a long way from a world in which cause and effect in social and economic systems can be established with the level of certainty we’ve come to expect from the physical sciences. In fact, the world of human behavior is sufficiently complicated and unpredictable that no matter how long or hard we try, we will always be stuck with some level of uncertainty, in which case leaders will have to do what they’ve always done and make the best decisions they can under the circumstances. It sounds like a lot of effort for an uncertain payoff, but curing cancer has also proven to be an enormously complex undertaking, far more resistant to medical science than was once thought, yet no one is throwing up their hands on that one. It is time to apply the same admirable resolve to understand the world—no matter how long it takes—that we display in our struggles to address the important problems of physical and medical science to social problems as well. This article is one of the best I've seen here in a while, and I am most definitely getting that book! Thank you Freakonomics! This is one of the things I love so much - I find new and wonderful things through you! Great reading. To prove your point, I wasn't going to read this article until I saw the positive comment by Dan Santo which piqued my interest into reading it. What I have become skeptical of is the black and white view that something is either this or that. Sometimes it's both. Case in point with the two quotes above -- the reasons behind why that's the case may vary, but both can certainly be true. Good stuff. Described this way, common sense reminds me quite a lot of creationism and other non-provable theories. While they might "make sense" and "feel right," they are in no way scientifically verifiable. It'd be interesting to read a study to see if people who are big fans of common sense also happen to be more likely to support something like teaching creationism in schools. Slightly off topic but sometimes I see government as a sports referee. No matter how competent, you don't see the things the referee does right but you notice when the referee makes a mistake or makes a judgement call against you. And you resent the referee's power in these cases. And you can add more referees (think bigger government) to the game but mistakes still happen as do the judgement calls against you. "Rocket science" is hard to learn but it applies to a specific context. That context uncovers problems and guides solutions to them. Social and political problems exist in highly complex contexts that overlap. One context will generate problems unexpected from the perspective of another and solutions in one context will have unforeseen effects in other contexts. Where is Hari Seldon when you need him? We have seen many of the things dreamed by science fiction authors become reality, will we witness the creation and use of psychohistory? Such an interesting possibility to contemplate. Thank you for the reference and the acknowledgement that someone else thinks Hari might have a viable explanation. I actually don't think the quotes are in conflict. The reason is that they are fundamentally different points of reference. We expect government to address major problems with basically one try i.e. here is our solution to poverty, education, health care and so on. Nowhere else in life do we try one thing to solve a problem or create something. Simplified example: When the computer was made there were hundreds of companies trying hundreds of 'ways' to make it work. Some hit on the right way and survived, others fell away. Then some of the successful ones faded and new companies entered and came up with newer innovations. Yet the government does something and if it fails they throw more money at it as if lack of funding was the only cause of failure. As to the Frist quote. It isn't rocket science because we have market examples that point the way to a solution. No single effort is ever going to identify the solution and yet it is not impossible to solve because people are experimenting all the time. Once a good solution(s) rises it is no longer 'rocket science'. That doesn't mean government can't do anything. It does many things well. Established and tried efforts. Innovation, very rare with government. And not forever either. Post Office. Great in its time and a tremendous benefit to the country and our quality of life. It can't keep up with the times however. Not because it is bad or terrible or evil but because it is only one solution and the odds of one solution being the 'one' in the market place is near zero. That's the point: Common sense's aphorisms have no frame, yet frame is required to reconcile these statements. Therefore, using common sense on problems is like trying to solve a Rubik's Cube just off its shadow: you are missing the colors and the geometric arrangement! How can you possibly expect to really solve the puzzle? Up until now, perhaps the puzzle was just "play tic tac toe," where you could eventually stumble upon a win even if you were blindly marking X and O. When the game is chess, however, we may need to take off the blindfold and realize what we were doing up until now was child's play. Not sure if the initial connection between common sense and picking future classics holds water. The bulk of the article, about what makes a breakout hit, touches on great concepts. Finding cancer cures assumes every party agrees that a cure is the common goal and this alone greases the skids for solutions. Individuals in government searching for political solutions lack agreement on results let alone on methods for getting there. The axiom, "Common sense is not so common" might expose our suspicion of simple explanations and we gravitate to mysterious shooters on the grassy knoll. "Common sense is particularly well adapted to handling the complexity of everyday situations. We get intro trouble when we project our common sense to situations outside the realm of everyday life." This is precisely why I get so bristled when people write blog posts proclaiming why certain gadgets get popular. A ton of revisionist history to make it fit their story, no real research. Really? Perhaps the author ought to more appropriately address why *every* generation is convinced that *now* is *far* more complicated than ever before in history AND what worked before is *totally* insufficient now! People deal with life situation by situation. A response that worked in one situation will be tried in a similar situation. If it works again, woot! Profit! We call this learning. Because human beings, including the author, encounter very different situations day by day and moment by moment, we develop a repertoire of responses and we draw from this arsenal every time we encounter the world. We accrue these successful bits (Birds of a feather and Opposites...), but never quite jettison the unsuccessful bits (Birds of a feather and Opposites...), because they might be useful in a *different* situation. This approach, far from resulting in a poor system, produces an amazingly robust system that has given us everything from Ronco products to amazing material science out of MIT. The important thing to recall is that, whether we are dealing with the bag boy or the rocket scientist, the mechanism is EXACTLY the same, situation, response, alternative response until success or escape. Period. This means that the PhD is no more capable of dealing empirically, dispassionately or successfully with the hyper-complicated world that the author posits than the bag boy. All the PhD has is, we hope, a broader repertoire of responses, albeit in a much narrower field. Wait a minute. That means that the PhD is drawing upon the combined successes *and* *failures* of those who came before him. In every technical and non technical field, 'settled science', the combined experience of all who came before is simply regarded as ... wait for it ... common sense. I think this is brilliant but I think you left out an important caveat. I give an example of how science only gets you so far. We could pinpoint (almost) exactly the impact expanding Medicare coverage will have but people will disagree whether the tradeoff between x amount of lives saved and y quality of life improvement for the poor is worth z about of decrease quality of life for whoever pays for the program. What is and isn't a problem and what is and isn't a solution depends on VALUES and not just facts. That said, considering facts would get us a long way toward convergence. Well, yes and no (not about being brilliant, and thanks, BTW). Values are the verbal expression of the set of more or less successful strategies for ensuring an individual feels better or less bad. If we look at values in this way, we see that people verbally express 'rules' that concur with the sum of their most successful (makes them feel good or better) experiences. This is not a knock on anyone's values and it does not diminish the expression of values, this is just a more precise expression of the origin of what we describe with the vernacular. When we respond to the panhandler, it is only a response concurrent with our personal history (or common sense). But we also must include the other frequent responses, avoidance and escape. How many people simply do not look at the down and out (avoidance)? How many will actively change where they walk or drive to not come into contact with them (escape)? These too serve to make the person 'feel better,' since getting away from something that makes you 'feel bad' is simply the obverse of the social psych argument. The problem is the same, though, as with 'common sense'. We retain the responses that are successful, but we also retain both the responses that are not successful, neither adding nor detracting from us, *and* the responses that actually do harm, the latter because we 'learn' to avoid them *and* retain them for possible use in other circumstances. This means that we may have learned a rule, from our culture, our friends, our church, etc., that says the proper response to poor people is to give them stuff and we may never have considered whether this rule is valid at all, valid occasionally, or valid only in certain circumstances. The Peace Corps begins with the adage, "Give a man a fish..." This is an example of the deliberate consideration of which of the applications produces the greatest *long-term* benefit, and this I applaud. Although, at the other end of the envelope, we *have* to consider that it would do no good to *deny* a man a fish, if, through starvation, he is not alive tomorrow to exercise what we taught him about fishing. If you're interested in this sort of thing, read Thomas Sowell's description of the history of the creation and implementation of Welfare, which had originally been pitched, by Democrats, as a plan to get folks *off* of the public dole. So, what's the take away here? Too often we are asked to defer to experts who have no better mechanism than do we for making decisions. So, we ought to make a concerted effort to make individuals better 'experts' about their own 'values'. Teach more people to actually examine their 'feelings' and self expressed rules of behavior against a standard and help them decide to either adjust what they express to fit what they actually do, or to become comfortable with what they do, because they can express good reasons why they do what they do. In essence, give people 'common sense' examples, give the fish or teach to fish, and talk about the likely benefits and drawbacks of both approaches. Teach them the behavior of questioning *what* they believe, and *why* they believe what they believe. For some, this may result in big life changes, for others, simply the comfort of knowing that they were on the right track all along. For most, though, I think it would result in fewer people willing to espouse, unthinkingly, ideologies in broad sweeping terms, as if any idea is suitable and applicable to all circumstances or completely unsuitable or inapplicable to any circumstance (e.g. abortion, death penalty, taxes, government). I think it would reduce the thoughtless rhetoric and chanting of 'Four legs good! Two legs bad!' that we see from *both* sides of most arguments, and produce people able and willing to *listen* to the other view, check it against what they believe, and come to better understandings and better solutions for what we now view as intractable impasses. You cannot use science to predict social outcomes, much less economic outcomes. They will resemble a random walk. For example, if one could predict Mona Lisa being the most expensive, one could have bought it earlier. But that may have prevented it becoming the most expensive, the most likely outcome. There are also powers that shape society, and that shape culture according to their ideas. To understand changes, you'd need to understand the handlers, and their thoughts and plans. Smells like another round of positivism in sheep's clothing.